Washable leather goods in beautiful colours! Moose, Deer and Buffalo leathers, "Hides in Hand" design fashionable leather wear that are both beautiful and rugged. 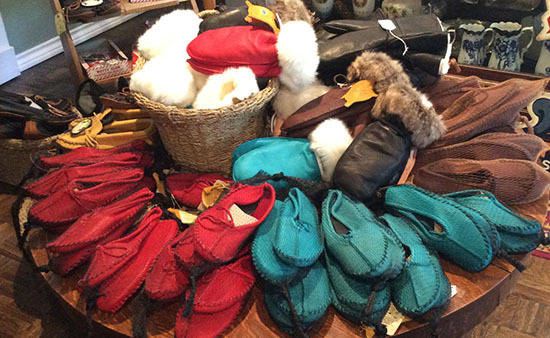 Authentic moccasins, ankle boots, mukaluk boots, mitts, hats and purses. Hides in Hand are superior products that maintain the history of Canadian leather quality. 100% Canadian Handcrafted products using regulated hides collected from local hunters --we do not use inferior substitution leathers or import any foreign materials used in our products. Hides in Hand is about keeping quality and tradition alive within the leather industry and protecting our resources and animals to maintain renewable resources.